As jihadists make Yezidis suffer once again on the Syrian-Iraq border, here’s my chapter from Dining with al-Qaeda devoted to my weeks with the community during the U.S. invasion of Iraq in 2003. 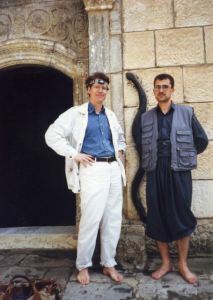 Hugh Pope and Sagvan Murad in front of Yezidi shrine Sheikh Adi. Lalish, 2003.